A text messaging platform set up by Rep. Beto O'Rourke’s (D., Texas) Senate campaign sent out a blast on Wednesday asking for "volunteers to help transport undocumented immigrants" to the polls. The O'Rourke campaign confirmed the text message was legitimate, not doctored, but denied that it was authorized by the campaign, according to the New York Times. The text was shared on Twitter Wednesday evening read, in two parts, "Hi, it's Patsy here w/ Beto for Texas. Our records indicate that you're a supporter. We are in search of volunteers to help transport undocumented immigrants to polling booths so that they will be able [to] vote. Would you be able to support this grassroots effort?" O'Rourke's campaign claims someone accessed the text message system to send the text in question, but it was sent illicitly. "That was not an approved message by the campaign," spokesperson Chris Evans said. The person who sent the text was "not a volunteer with the Beto campaign," Evans said, calling the sender an "imposter." The text messaging application used by the O'Rourke campaign to reach voters is called Relay and has a wide reach. O'Rourke's Republican opponent Sen. Ted Cruz has even received the text messages from the O'Rourke campaign. According to Relay's website, the company charges 8 cents per outgoing message for political campaigns. It is not clear how many text messages from this "imposter" were sent or how much the O'Rourke campaign has spent on text messaging overall. Relay was created by veterans of Bernie Sanders’ 2016 presidential campaign. Those who sign up to volunteer on O'Rourke's campaign website can indicate they are interested in receiving text messages. The O'Rourke campaign has not provided information on who actually sent the text message in question. 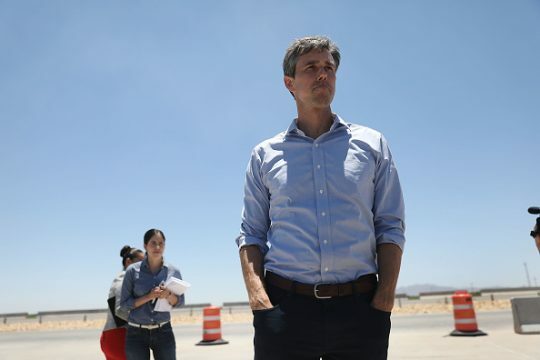 O’Rourke has received a bevy of media attention during his campaign to unseat Cruz, although he has recently had to answer questions after additional details were released about a drunk driving arrest in 1998. This entry was posted in Politics and tagged Beto O'Rourke, Illegal Immigration, Ted Cruz, Texas. Bookmark the permalink.